Suffolk County Wildlife Removal | EcoTech Pest Control Inc.
Wildlife can be nice to look at, but if they get into your yard, they can make quite a mess. If they get into your home, attic or basement, it can be trouble. Wildlife can carry many diseases and can cause serious harm. 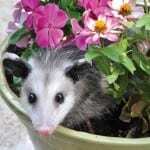 Suffolk and Nassau County is home to many different types of wildlife including possums, racoons, mice, rats and other vermin. Get rid of them today, call (631) 887-3028 or (516) 226-0988 or schedule appointment EcoTech Pest Control for humane removal, fast relief and peace of mind.